Appearance: large grey-black leaf, well made with some twig mixed in. The tea presents its hand-made, village-production look with authenticity. Flavor: fresh, fruity-ness mingled with a touch of eucalyptus and other forest scents. 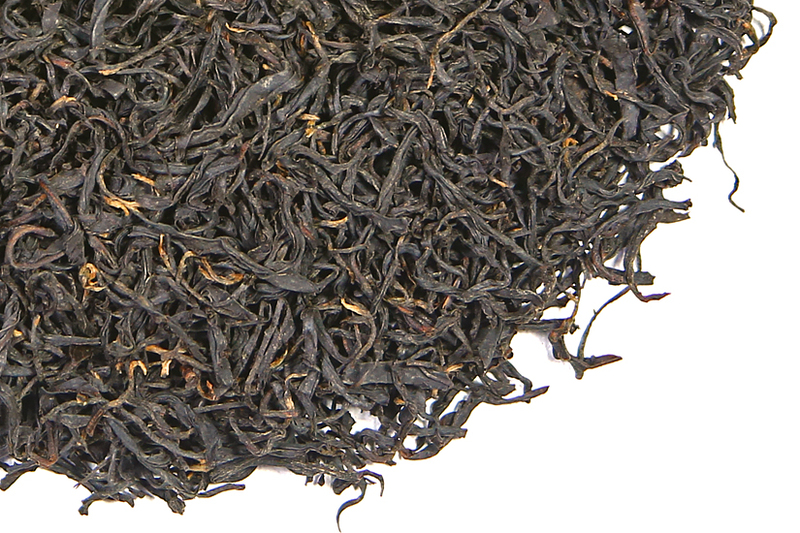 Light, soft and lean on the palate with a nice long – really long – finish which is unusual for black tea. Aroma: clean and fresh with a forest intrigue. It has a polite touch of woody astringency, and a dryness that hints at an abundance of aroma locked up in the large leaf waiting to be released upon steeping. 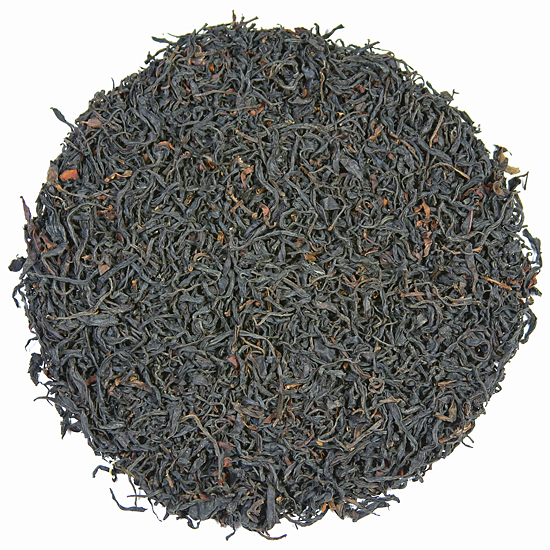 This tea is absolutely delicious – one of the finest black teas that we have in our repertoire at the moment. If you are looking for a new tea to try or a change of pace, give AiLao Shan a try. 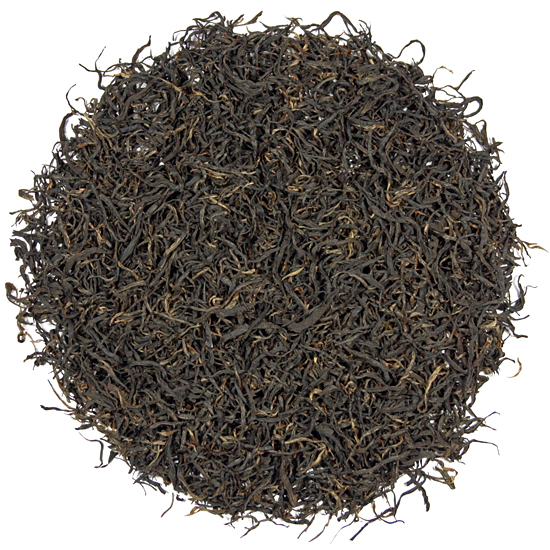 The aroma is reminiscent of a hearty Assam black tea from northeast India (which makes some sense given the presence of Camellia assamica in these parts of Yunnan Province) but the resemblance stops there. Our AiLao Shan has only a very polite touch of woody astringency in the aftertaste. 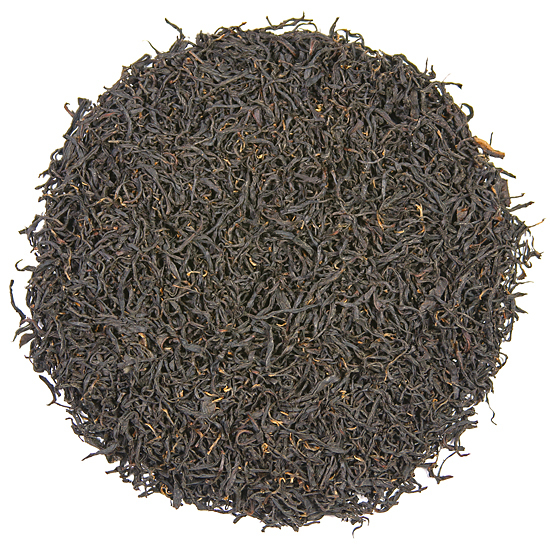 The flavor has a nice long – really long – finish which is unusual for a black tea. Don’t be surprised if your batch of tea contains a few small un-opened dried tea flowers or two ! These teas are sorted by villagers who expect the flower buds to be there…. so not every one is removed! Yunnan AiLao Shan dian hong is a long, slightly-thick, strip-style black tea made from old-growth tea trees. It yields a brownish-red colored liquor, a striking, exotic aroma, and elegant, slightly-sweet-fruity, smooth flavor in the cup. The appearance of the leaf shows careful hand tendering of this leaf and its size confirms that it is not a plantation-sourced tea. It is a classic example of a tea that shows much promise in its dry leaf form and then fulfills that promise and more in the cup. Sourced from Zhenyuan Yizu-Hani-Lahu Autonomous County in the Simao area of Yunnan (and tended by the ethnic minorities that protect many of the village tea tree groves located there) our AiLao Shan dian hong is one of our most recent additions to Tea Trekker’s treasure trove of black teas from this tea-fantastic region of Yunnan, China. Zhenyuan County spills across two mountain ranges – Wuliang Shan and AiLao Shan – that run parallel to one another, stretching from north to south in Simao Prefecture. These heavily forested, bio-diverse mountain areas are home to many wild tea trees and old cultivated tea groves that yield an astonishing array of unique teas with distinctive tastes. Each tea we taste from these regions is so different one to another – in a world that increasingly has a dark and gathering sameness we are grateful for that diversity and personality in the cup. AiLao Shan dian hong is harvested from old-growth tea trees in the Zhenyuan area. This area produces some of our favorite Yunnan black teas that are delicious drunk both young and aged. Our AiLao Shan tea has been lightly oxidized so the steeped leaf may show some greenish-red color. The taste has a fresh, fruity-ness with a touch of eucalyptus mingled with other forest scents. Some teas from this area have an abundance of rich, buttery, caramel-sweetness, but this tea is light, soft and lean on the palate. NOTE: We have recently shifted from offering the last of the 2015 Spring Harvest (which was a fantastic vintage, but alas, has all been drunk…) to tea from the Spring harvest of 2017. We do enjoy being able to offer several Yunnan black teas that have been either rested, or aged – and this is one that we do really know improves with a little maturity. It is drinking well now and should for several more years, perhaps as many as ten years (but who will be able to keep it that long? we certainly won’t be able to!) So this 18-month-old leaf is drinking well now and should be a real treat for all of our Yunnan black tea enthusiasts. This leaf will age really well … want to know more?